Apple has just released iOS 7.0.6 and it is now available for download. The update has been released for every iOS device including all iOS 7 supported models of iPhone, iPad and iPod touch. It is not a major release and does not brings any notable changes or features to the software. 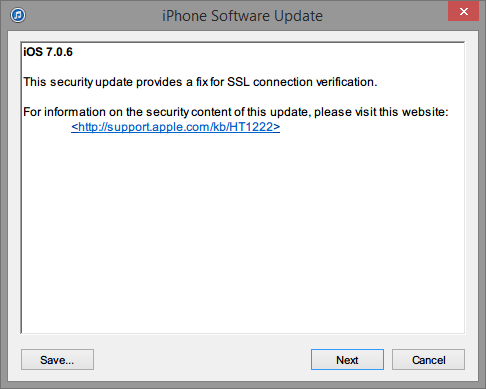 According to Apple’s change log for iOS 7.0.6 (build number 11B651) the update brings a fix for SSL connection verification. iOS 7.0.6 is available through iTunes, OTA and as a direct download. Although for some reason the OTA isn’t working for us and is stuck at “Checking for update”. iOS 6.1.6 has also been released with the same fix for older devices such as iPod touch 4th generation. You can download iOS 7.0.6 using the direct links below. After downloading you can manually install it by restoring your device. If you jailbreak your device it is advisable to stay away from the update.